Exercise is important, especially during pregnancy. 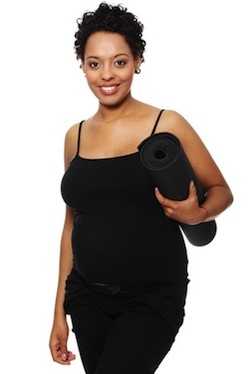 Angel J. Miller, a certified nurse-midwife from Washington, DC, says benefits to exercising wisely throughout pregnancy include increased energy, good mood, better sleep, stronger muscles, an easier delivery, and fewer pregnancy pounds to lose later. Miller, director of Midwifery Service in the DC area and co-author of a book titled Nine Months In - Nine Months Out, urges expectant mothers to consult their doctor before beginning a new exercise regimen and to start slowly and increase time and intensity level as the body adjusts. A good cardio workout means you can talk while working out but you’ll be too winded to sing. Invest in some comfy walking shoes that provide plenty of support then grab your partner or your dog and go explore your neighborhood on foot. Miller cautions expectant walkers to be aware that your center of gravity will change as the pregnancy advances. Your sense of balance and coordination will change so stick to walking on smooth surfaces and avoid rocks, potholes, and similar obstacles. Water aerobics are great cardio workouts and buoyancy of the water takes pressure off joints while minimizing the heaviness of a baby bump. Cautions? Do what’s comfortable without straining neck, shoulders, and back. No diving or jumping into the water while pregnant and do use a handrail for support getting in and out of the water. Avoid pools that are too warm, steam rooms, and saunas. Stationary bikes give muscles and cardiovascular system a workout without stressing achy joints. The stability of stationary bikes makes them safer than regular bikes during pregnancy, when a growing tummy can throw off balance and cause cycling accidents. Do adjust handlebars as the pregnancy progresses to minimize strain on the back and shoulders. Prenatal yoga poses will keep you limber and flexible to minimize the risk of falling. Yoga will tone muscles, stimulate blood circulation, boost the immune system, and relax you. The relaxation techniques learned in a prenatal yoga class can be used in the delivery room, too. Don’t overstretch, especially during the second and third trimesters, and avoid poses that are so challenging they make balance tricky. Also avoid poses that require laying flat on the back during second and third trimester; by this time in the pregnancy, the uterus is heavy enough to put unwanted pressure on major veins and arteries in the abdomen. If you’re new to aerobics classes, choose a class for pregnant women. Your instructor will know what’s safe during pregnancy and you’ll have the company of other expectant mothers to exercise with. If you already do aerobics regularly, tell your instructor you’re pregnant and ask for guidance in making class safe throughout the pregnancy. High-impact aerobics often involve jumping, kicks, and running. These moves produce too much bounce on the pelvic floor. Limit moves to only those that keep one foot on the floor at all times and modify moves as advancing pregnancy affects center of gravity. Moderate exercise during pregnancy is safe for most women but get your doctor’s OK first and be sure to contact your doctor if alarming symptoms or sensations develop. Miller, Angel J. "5 Best Exercises During Pregnancy." MNT / Medical News Today. MediLexicon International Ltd, 9 Mar. 2015. Web. 24 Mar. 2015. "Pregnancy and Exercise: Baby, Let's Move!" Mayo Clinic / Pregnancy Week by Week. Mayo Foundation for Medical Education and Research, 10 July 2013. Web. 24 Mar. 2015.